Courtesy of Melissa Berkay, Manhattan Island, New York. College student Melissa Berkay specializes in the 200-yard butterfly where she represented Mills College at the 2016 NCAA Division III Championships. She also works part-time and writes about open water swimming for Swimming World Magazine. While the 200 butterfly is considered to be one of the most grueling races among pool swimmers, Berkay goes a lot further in the open water in her favorite stroke. She completed the second butterfly crossing of the Catalina Channel in history in 2016. Swimming in 12 hours 37 minutes, she set a course record. She writes of her next goal to complete the circumnavigation swim around Manhattan Island in 2018. 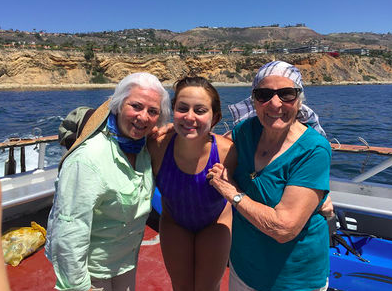 "Last summer I swam the Catalina Channel in butterfly [while] I was able to raise funds for three homeless shelters, as well as pay for my pilot, boat, kayakers and transportation. It was all made possible by GoFundMe. The fact that so many people supported my goal to complete the channel last year while supporting local charities reminded me that anything is possible, and that even if one does not have the means to complete a project, there is no shame in asking for help." Her main goal for her 28.5 miles of butterfly around Manhattan Island is to support local charities. "Although I am using this GoFundMe to fund my swim, I would like to fundraise for local charities after the swim funds are met. I am constantly inspired by marathon swimmers around the world, and seek to follow their example in spreading faith and hope that anything is possible." A television interview with Berkay is posted here; a radio interview is here. Her GoFundMe page is here.